They visualize the entire greenhouse being taken over and shaded by thick, lush growth, that becomes covered with large colonies of mealy bug, red spider and while fly. At least that is the way it first appeared to me but after trying a selected group I soon discovered what I had been missing. The plants were not difficult to keep within bounds, insects were not a problem and the climbers added a pleasing touch to the greenhouse throughout the year. Most climbers can easily be confined to ten-inch and smaller pots or tubs. Some will even start flowering when quite young in 4 or 5-inch pots. 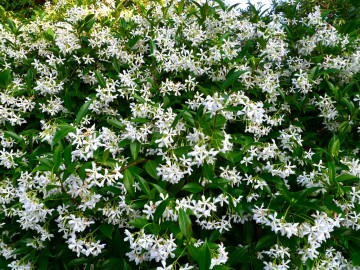 The beautiful star jasmine (Trachelospermum jasminoides) has done beautifully in a 4-inch pot for the past three years. It flowers from early spring to fall in clusters of fragrant white stars at practically every joint. If the wiry growth reaches out too far, it can be just snipped off, yet the plant never seems to mind and there is little or no loss of bloom. Like all but two of my climbers, this plant is grown on a light fan-shaped trellis for, as some neat form of support, essential to all the climbers and twiners. Only two climbers are permitted to reach up into the rafters in my greenhouse. One is a Hoya carnosa; the other is Plumbago capensis. Both are easily controlled and do well in 6-inch pots. The Hoya reaches 6 to 8 feet with coarse fleshy leaves. 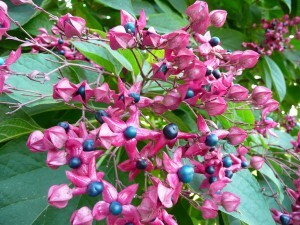 The flower clusters are fragrant and waxy in white, tinted pink. They appear in late spring or summer. The plumhago sets on a shelf and is especially desirable for its azure blue clusters of flowers that follow one another on the tip of each branch from spring to late fall. Jasmine flowers in our greenhouse from spring to very late fall. It is tops for delicate fragrance. This is a cool greenhouse plant, however, and when the the greenhouse temps reach 58° to 60°, the flowers soon drop, but even though short-lived they are well worth having. Solanum jasminoides is always a joy because it is continuously in flower. Blooms are in clusters of 12 or more delicate white stars with yellow centers. It is one of those plants that starts flowering while very small and although it is a vigorous grower, it can be easily controlled within 3 or 4 feet. Clerodendron thomsoniae with white flowers and red centers is a must for every warm greenhouse. It regularly blooms in the summer but can be flowered by early March if kept on the dry side from fall to mid-winter. It doesn’t pay to continue growing old plants for too many years. They become hard and difficult to control. It is best to start new ones from cuttings of half-ripened wood. The foliage as well as the flowers of this plant are beautiful when well grown. With insecticides chemical or organic available today, there is no need to fear of the worst of pests. Be sure to follow the manufacturer’s instructions exactly for safety when applying insecticides. Astilbe Japonica – Divide root clumps at the end of this month and repot for next year’s crop. Butterfly Bush – Buddleia – Cuttings should be taken now for blooms next winter. Caladium – Clean tubers and start in sand or sphagnum moss. Do not over-water or they will rot. Candytuft – Plants from seed sown in March should be ready to bench low. Chrysanthemums – It’s none too soon to start the early varieties for flowers during early October. Do not leave in propagating bed more than 21 days or growth will become stunted and hard. Felicia Amelloides – Take cuttings now to have those beautiful blue flowers to cut next winter. Fuchsias – Take cuttings now and set in 3-inch or 4-inch pots. Stephanotis – Start new plants from cuttings of well ripened wood. This is also a good season to root cuttings of many shrubby and herbaceous pot plants that give so much pleasure in the greenhouse. They are plants that can be grown year after year. But for best results they should be replaced every three or four years with new plants, for old hard growth is never so floriferous. Included are: allamanda, acalypha, bougainvillea plant, linaria, milkwort (polygala), stevia and many others. Bedding Plants – A wide variety should be sown this month including: ageratum. alyssum, lobelia, lupine, marigold. nasturtium. nemesia, petunias, salpiglossis, snapdragons, torenia, and zinnias.